Please see the OLLI Central Spring term registration link below. You may also find links below for viewing videos on how to register and a link for the catalog. OLLI members may participate in as many classes as desired at any of the six OLLI sites - Central, West, South, OLLI On-Campus, East and Boulder (contingent upon space availability) for $130 per term. OLLI has three terms per academic year: Fall, Winter, and Spring. Classes at all Central locations: all OLLI Central classes will be cancelled if the Denver Public Schools (DPS) are closed. Late Start: If the school district announces a late start, classes will be held as usual. Inservice Days: If the school district is closed for inservice during a snow day, there would be no announcement on the news. In that event, the greeting at the OLLI office, 303-871-3090, will be changed by 8am to announce whether classes will be held or not or check this website. Michael Bender, former Chief Justice of the Colorado Supreme Court, answers audience questions at the Oct. 14 Hot Topics Luncheon. Over the course of four weeks we will use the Denver Botanic Gardens as our classroom to study the past, present and future of the natural world that the garden represents. We will tour the gardens with a different focus each week, building a broader overview of how the natural world reflects its human co-habitants. While we will cover a range of eco-systems, we will emphasize our local environment. The course will involve tours of up to an hour and a half in lengh, so a certain amount of stamina will be helpful. OLLI Central Planning - Mark the Dates! For upcoming special events and activities, See Events Tab. Special opportunities for OLLI members See Member Opportunities tab. I want to receive OLLI emails! Sign up to receive all the exciting OLLI news and event announcements. 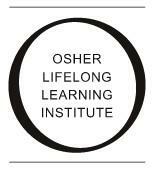 The Osher Lifelong Learning Institute (OLLI) at the University of Denver is a membership program designed for men and women age 50 and over, who wish to pursue lifelong learning in a relaxed non-competitive atmosphere. There are no tests, no grades, no academic requirements - just a desire for learning and a penchant to be curious. Thanks to the generosity of the The Bernard Osher Foundation, OLLI at the University of Denver joins a network of 122 Osher Lifelong Learning Institutes across the United States that are meeting the needs of older learners who want to learn simply for the joy of learning and personal fulfillment. OLLI needs believers like Bernard Osher. The development and delivery of quality educational programs for 50+ adults is important for sustaining quality of life and healthy minds. If you would like to help fund scholarships, programming or our research, please contact us at our office, 303-871-3090. The content displayed on this portfolio may not be accurate. Portfolio content is managed by individual users and is not property of the University of Denver.